Lake Manyara National Park is one of Tanzania' s smaller parks. Its vegetation is diverse, ranging from savannah to marshes to evergreen forest. Created to protect its magnificent elephant herds, Manyara National Park is equally famous for the unusual behaviour of its tree-climbing lions as for the flocks of pink flamingos that inhabit the lake&apos;s shores. The reserve is considered to have the highest density of the olive baboon with troops of up to 200 members. The acacia dominated woodlands around Lake Manyara provide the perfect habitat for the Maasai giraffe. 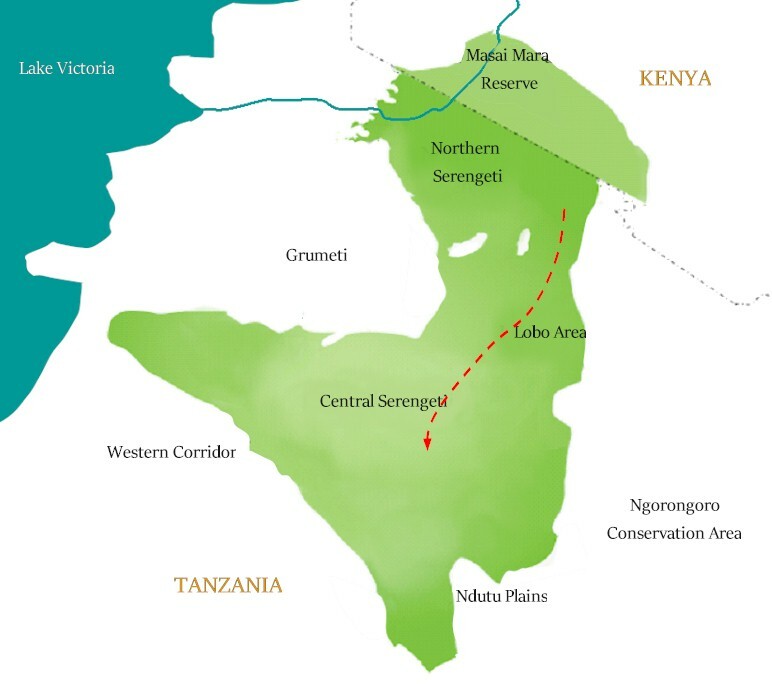 The Ngorongoro Conservation Area (NCA), measuring 8,300 square kilometres, is also the only place on earth where mankind and wild animals co-exist in harmony. Had it not become the world&apos;s sixth-largest unbroken caldera, then what is now known as the Ngorongoro crater could have been a towering volcanic mountain, as high as Kilimanjaro. Serengeti National Park is at the heart the larger Serengeti ecosystem, which is defined by the area covered by the annual migration. The vast plains of the Serengeti comprise 1.5 million ha of savannah. The annual migration to permanent water holes of vast herds of herbivores (wildebeest, gazelles and zebras), followed by their predators, is one of the most impressive natural events in the world. It is the migration for which Serengeti is perhaps most famous. Over a million wildebeest and about 200,000 zebras flow south from the northern hills to the southern plains for the short rains every October and November, and then swirl west and north after the long rains in April, May and June. So strong is the ancient instinct to move that no drought, gorge or crocodile infested river can hold them back. The closest national park to Arusha town is Arusha National Park - a multi-faceted jewel, often overlooked by safari goers, despite offering the opportunity to explore a beguiling diversity of habitats within a few hours. Tarangire National Park is the sixth largest national park in Tanzania, it is located in Manyara Region. It is most famous for its elephant migration, birding and authentic safari atmosphere. With it being roughly roughly ten times the size Lake Manyara NP, Tarangire is a little gem on the Northern safari circuit not to be missed. Like Kenya, Tanzania is a magnificent place for a safari. The national parks are massive compared to many in Kenya yet offer a diverse array of animals and bird life. The best place from which to view the mass migration of zebra and wildebeest is from the Serengeti Reserve in Tanzania. Like Tanzania, Kenya is a magnificent place for a safari. The difference is that the scenery from one national park to the other is so diverse that you would easy believe you were in a different county. The best place from which to view the mass migration of zebra and wildebeest is from the Masai Mara Reserve in Tanzania. The annual migration of the animals, (wildebeest and zebra) takes place each year between June and October. The flow of animals moves from a southerly to a northerly and westerly direction as the herds head north towards the Mara River in search of food. Between July and August each year, literally millions of wildebeest, often aptly termed the clowns of the African wildlife, head in their droves from the Serengeti in search of fresh grasslands further north towards the Maasai Mara in Kenya. Around November of each year, they turn and head back in a south easterly direction towards Tanzania. The flow of animals is entirely dependant on the weather and so the patterns change from year to year. Below is a rough idea of how the animals move over the course of each year, by following the movement of the arrows.